Funny, you google "egg roll" and all you get are pages about American Chinese spring rolls. 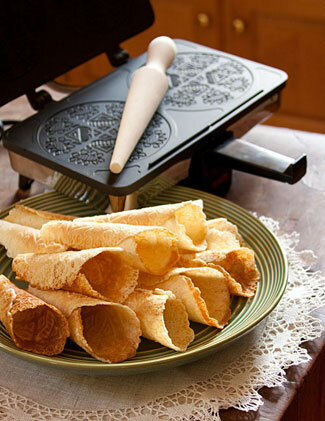 But enter "hollow egg roll" and most of the search results are for egg roll machines, of the straw-shaped dessert variety, usually jazzed up with a chocolate swirl (here's an example). Look up "phoenix egg rolls" or "鳳凰卷" and you get folded, pillow-shaped products from Macau, for instance from the Koi Kei bakery (and it's impressive to watch someone folding the rolls by hand). For the record, what I wanted was to find a good recipe for making basic Chinese egg rolls, of the moderately sweet, flaky, tubular persuasion (as eaten in Hong Kong, Macau, and the southern parts of mainland China), by hand without the use of a machine, hot iron plates, or other specialist equipment. 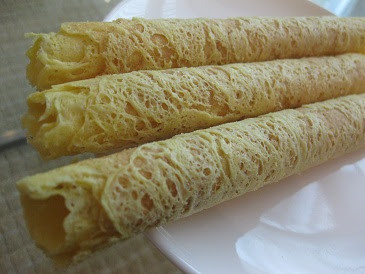 Egg rolls from Duck Shing Ho factory, picture from buriki blog. Look at those web-like layers! Love letters and mould from an online trader. The Norwegians have a Christmas cookie called krumkake, which has similar patterning, but is rolled into a cone rather than a cylinder. The batter may be spiced with cardamom or nutmeg, and they are sometimes eaten filled with whipped cream and fruit, like a brandy snap. Norwegian krumkake with decorative iron and shaping cone, from Lefse Time. 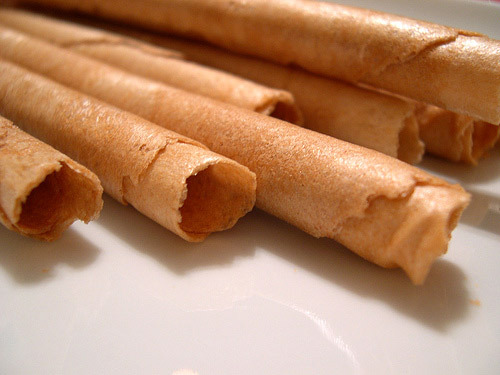 Much more surprising to me is that the Spanish, and by extension the Filipinos, have a dessert called barquillos, or neules in the Catalan language, which is basically identical to the Chinese egg roll. Some make them with whole egg, some just with the whites, some just with the yolks, and some add lemon rind, but apart from minor differences, they seem to be the same thing. The Filipinos have also branched out into other flavours, for instance ube (purple yam) and pandan. Spanish neules, from Gastronomía y Cía website. Coloured barquillos in the Philippines, photo from bucaio blog. Flavours shown are strawberry, ube, pandan, coconut, chocolate and goat's milk. While all the Chinese recipes contain eggs, butter/lard, flour and sugar, there is some variation between them. The version on Cooking of China makes use of "sweet potato mud", which I assume is kumara purée, as well as milk. In Kitty Choi's Foundation Dim Sum Making cookbook, she adds milk, coconut milk, dessicated coconut, custard powder and baking powder. Other recipes throw in a sprinkling of salt and sesame. What I am most intrigued by is how the best egg rolls have that rough, lace-like surface. Is it a result of the ingredients, or the cooking technique? This forum post proved to me that no fancy machine is required to obtain a beautiful texture, but the photo accompanying every recipe I found presents egg rolls with a smooth surface. I guess I just have to give it a try myself, and see. 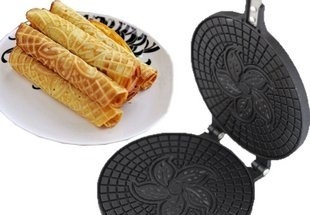 The Norwegian krumkake looks really similar to the ice cream cone they use in Starbucks... even the roller looks similar!? Thanks for sharing that, Indriana! It sounds similar to what they make in Malaysia and Singapore, but I didn't find out about the Indonesian version earlier because there is not much written about it in English.